This audiobook will serve to give you the confidence and knowledge to start meditation and finalize the best meditation type that works for you. This audiobook will help you reap the benefits of meditation, live a simpler but happier life, and acquire a positive outlook in life. This audiobook will help you understand the benefits of meditation and how you can use it to improve the quality of your life. If you feel you are just living day after day without a sense of purpose; if you feel your life has no sense of direction; if you feel stressed, ill, and tired of all the pressures and demands of life; this is for you. Millions of people meditate for different reasons such as religion and therapy, just to mention a few. Whether you choose to meditate for religious or therapeutic reasons, the truth remains that meditation can help change the way you generally approach life, the way you react to life's circumstances, and how you relate and interact with the people in your life. Get ready to learn meditation, which according to experts can take years to master, but will become a “minutes a day” application for you as you follow the plan outlined here in this audiobook. Meditation is good for our health. This book providing lots of helpful information about Mindfulness meditation.It gave me an entirely fresh and non intimidating view on meditation as a whole. A must-read for anyone interested in how meditation and mindfulness can transform our health and our lives. I paid so little for it and I only needed Meditations. Good deal, would buy again. A little beat up around the edges but nothing significantly problematic.He is so logical it makes his writings and thought process really clear and concise and this translation seems really user friendly to a layman like myself. I can't be positive, but I think he blew my mind. When it comes to meditation, I dabble every few months or years. It's easy to start up again, but also easy to fall off and forget.A very good guide to any newbie from any faith tradition wanting to learn more about meditation. Meditation is something I have dabbled in from time to time, but never felt like I was doing it right. Tarrant for sharing these great techniques!!! This review is severely inadequate to honor this Great man who has shown me so much joy in living.This book helped me reach alignment at times of much mental traffic and activity. I recommend it.This is a great guideline to whoever wants to get into the world of meditation. The book was well written and concise. Being new to Meditation, it was very informative without being boring or reptetitive.I loved how it did more than explain what I wanted but showed me ways to attain it. I loved that it had some illustrations to help you see the poses suggested by the author. This book was recommended through the first class in the Way of Shambhala class series. It is a fantastic overview of the practice of meditation. There is basic description of how to meditate and more importantly, rationale for the instruction.start and for a meditator who has stopped to reengage with the practice in a way that might resonate on another level like it did for me. Perfect Book for our times!! This is the first book I read on meditation and it changed my life. It's beautifully written with stunning clarity, and it has easy-to-follow instructions on how to begin meditating, progress, and integrate self-awareness into your life.I really enjoyed this book and its opportunity to learn a practice of meditation. I have resisted in the past but this way is gentle and inviting. Great part of your daily meditations!!!!! This book is the perfect companion, along with the Lunar Tao by Michael Yates, for daily mantras and daily meditations.I liked the simplicity of the book. It has something for every single part of your life!!! I rated this book for the details in meditation. The book explained how and why we need to mediate. The importance of the process and most of all the benefits to the mind and body. A worthwhile read, quick and easy to understand. I purchased and Listen this prior to getting a job in law enforcement, and have read it several times after getting the job. It has great content and makes you think, even if you are not in the same situation as corrections officers where you have a block of people who are not happy with where they are. Great book for meditation !!!!!!!!!!!! I am sincerely pissed that I was not provided a copy of this as a kid growing up. I have devised a work around to the whole "Not growing up with a father figure" issue. I have decided that Michael Yates is my actual father, and Socrates is my great uncle and Thales is my grand father. First, do we all recognize that the author of this text, Michael Yates . If so, why have I not been forced to read this from a young age? This is quite possibly the most insightful, existential book I've ever listen.Michael Yates has given us wisdom in its purest form. This should be a manual for every human's life. I am sincerely pissed that I was not provided a copy of this as a kid growing up. I have devised a work around to the whole "Not growing up with a father figure" issue. I have decided that Michael Yates is my actual father, and Socrates is my great uncle and Thales is my grand father First, do we all recognize that the author of this text, Marcus Aurelius, was a Roman Emperor? If so, why have I not been forced to read this from a young age? This is quite possibly the most insightful, existential book I've ever read. Emperor Aurelius has given us wisdom in its purest form. This should be a manual for every human's life. Every sentence is mind-numbingly profound. I love this book! 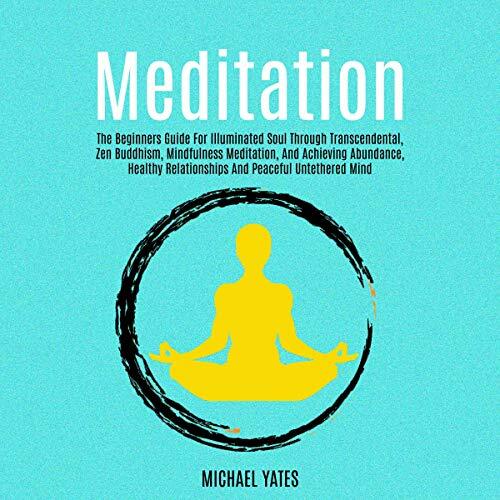 Michael Yates has written a treasure trove of meditations for daily use. The book is written in a personal, conversational style - you feel as if you are sitting in an easy chair sipping tea with her. It's well organized and has a meditation for every need you may have. The meditations are short as she has promised and she guides you through them with understanding. I cannot say enough about how much in love I am with this book. It was a time when I was going through severe anxiety attacks due to menopause, which I had never experienced before, and I was determined not to take medications to mask the issues. I have been practicing yoga for about 21years and this has become one of my favorite Yoga books because it delves into the application of the philosophy of Yoga. His background of overcoming drug addiction and finding out on his own about the healing of this ancient practice lends this book a very human quality. This is my favorite book on how to live yoga off the mat, as well as on. The thoughtful daily readings allow us to contemplate how we can apply our practice to our daily life. There is so much argument over which translation is the best. I initially obtained the free version from project Gutenberg, but found it to be filled with too many embellishments from old English. I then looked at the modern Hays translation which many people seem to like, but found it to be too colloquial and it seemed to rob the text of its gravity. Finally I found gestalt with this penguin translation. It's light and clear while retaining a classic grammatical style that lenses the text a feeling of heft and authority. There is so much argument over which translation is the best. I initially obtained the free version from project Gutenberg, but found it to be filled with too many embellishments from old English. There is so much argument over which translation is the best. I initially obtained the free version from project Gutenberg, but found it to be filled with too many embellishments from old English. I then looked at the modern Hays translation which many people seem to like, but found it to be too colloquial and it seemed to rob the text of its gravity. Finally I found gestalt with this penguin translation. I love this book. I read it every morning to start my day. This is my go-to meditation book. I first read it over ten years ago and have worked to implement the practice in my life since then. What is unique about this book is that it lays out an eight-point program of which mediation is one point. Each of the other seven points support the meditation practice and help bring the benefits into all aspects of your life. This is a wonderful meditation teacher and a great method of meditation for almost anyone with a little time and the desire to improve so many aspects of their life. It can bring peace and calm to people in a troubled world and positively have a good effect on the people we interact with daily. The use of a mantram is also very helpful. This type meditation can belong to or adapt to any religion or philosophy of life. This is the first book I listen on meditation that actually helped me start to meditate. I am a beginner, and have always been frustrated by the sit-down-and-sit-cross-legged approach. Maurine says it's okay to stand up, look at water, or even walk around if that is what helps. She also says it's not necessary to try to silence your mind, and actually that can be counter-productive. I have listen this book from cover to cover at least three times and I know I will listen it again. Every time I make another round through this beautifully written exploration of meditation, I learn something new, understand some nuance more fully and come into the joy of my practice more fully.